FKP has opened its sales office for "The Milton", a new apartment building that FKP plans to build next to the railway line at Milton Station. 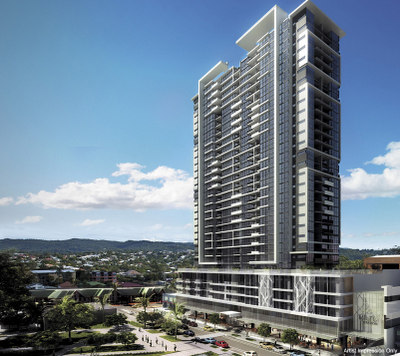 The building will feature 298 one and two bedroom apartments. There will be no three bedroom apartments. There is a pool. Shops are located on the ground level. 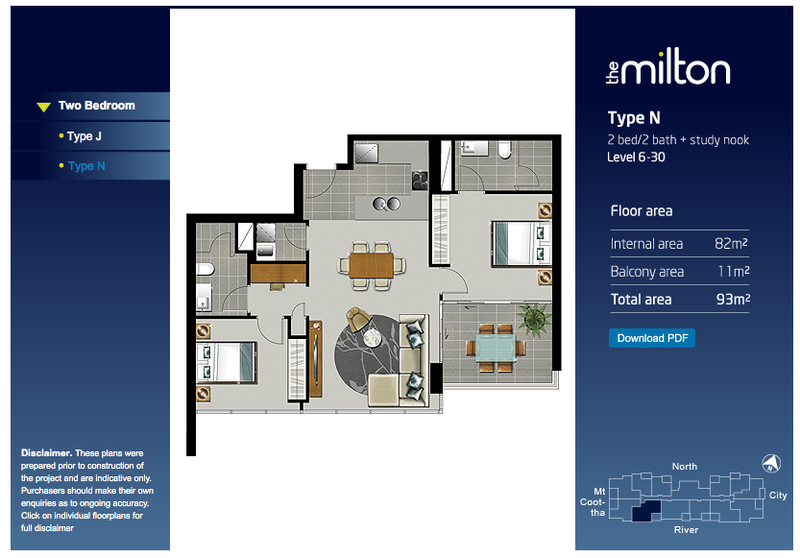 Compared to all recent developments for Brisbane apartments, the floor plans for the apartments in The Milton are the best that I have seen. The apartments have wide frontages, good light, storage space, and most have good sized kitchens (rather than galley kitchens). There are no internal bedrooms. The apartments are an ok size - the average size for a two bed is 92 sqm including balcony and 62 sqm for a one bed. FKP's recent developments in Brisbane have not been great. Vue at Milton was did not turn out to be great, and many of the apartments there are still selling below the original sales price. The Albion Mill project never started. I considered the SL8 development at West End to be a disappointment. The Milton is being built on a railway. The Milton is located close to the XXXX brewery, and so residents will be impacted by smell, fumes and fallout from the brewery. Despite the nice brochures from FKP, The Milton is located a fair distance from the river. It is not river front, and will only have distant river views. There is the strong possibility that other towers will be built between this development and the river. In my opinion, the artist's impressions being distributed by FKP are somewhat misleading. There is the risk that the apartments on each end will be built out if similar apartment buildings are constructed on the neighbouring land. The Milton is not on a corner block, and this is a risk. The building does not have central airconditioning. The hallways are unlikely to be airconditioned. Not all rooms in your apartment will have an airconditioning output head. So FKP selected the low quality option here. The biggest downside to me is the price. FKP is advertising that the median (not average) price for 2 bedroom apartments is $778,049 and for one bedrooms is $430,497. For example, the apartment listed above (N type) on about level 12 is listed for sale at $795,000 plus an extra $12,000 for the "upgrade" interior package. This is over $8,500 per sqm metre, for an average residential starter apartment -- we are not talking about a luxury building or prime location here. A two bedroom M type on lower than level 10 will cost $785,000 plus a $10,000 upgrade package. A two bedroom K type on a similar low floor will cost $748,000 plus $10,000 upgrade package. What is even more amazing is the printed information that FKP is giving out to potential investors. They have a sheet of paper showing investment returns for a 2 bed, 1 bath apartment listed at $650,000. The predicition is that this apartment will be worth $807,500 on completion of the project in 2013, and will be worth over $1M by 2016. The predicted rent is over $720 a week in 2013. Take note! Investors who purchased a 2 bedroom 1 bathroom apartment off-the-plan in Evolution (a better location, in the downtown area) over 5 years ago at over $600,000 are now having great trouble selling that same apartment for $500,000 today, and similar apartments in Felix are selling for about $450,000 today. So it is a bit rich to say that a two bed, 1 bath apartment at Milton is good value at $650,000 today, and I find it very hard to believe that it will be worth 0ver $800,000 in three years time. Great Post. For somebody not in the market, or even in the area, this was extremely valuable. All the things you listed to consider are sometimes not what people think to consider. Just because the marketing looks new and shiny, doesn't mean its the best deal out there! We all seem to get sucked up by great marketing.